Both models have Super AMOLED displays and both have the same 1080x1920 pixel resolution. This makes edges and text in the OS appear slightly less sharp on the Galaxy A7 compared to the Galaxy A5. 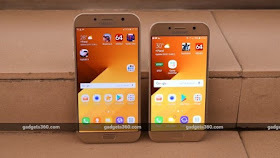 We also found that our Galaxy A5 (2017) review unit had slightly crisper whites and punchier colours compared to the Galaxy A7 (2017) sample, which exhibited paler whites and slightly muted colours. We have a physical home button below the displays on both phones, with two capacitive buttons on either side. The fingerprint sensors are fast at authentication and we like that you don’t have to press the button to unlock the phone, as they work with just a touch. In each phone's box, you get a stereo headset, travel adapter, charging cable, and user guide. 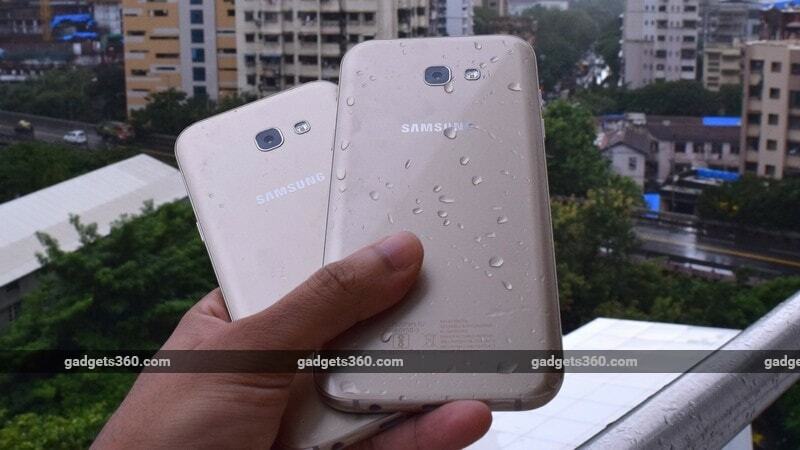 Overall, the new Galaxy A7 and Galaxy A5 stay true to their premium identities. The A5 is definitely more manageable in your hand, so the choice can come down to a tradeoff between screen size and ease of use. Samsung has fitted both smartphones with pretty much the same internals. Processing is handled by an Exynos 7880 octa-core SoC and 3GB of RAM. This SoC is a nice upgrade from the Exynos 7580 in last year's A-series models, with a smaller 14nm fabrication process and faster Mali-T830 GPU. It uses ARM’s big.LITTLE CPU architecture to bring together four Cortex-A72 cores and four Cortex-A53 cores. Compared to a Qualcomm's equivalent Snapdragon 626 which is used in phones such as the Moto Z2 Play, the Exynos 7880 seems to have a better GPU, but CPU performance seem comparatively weaker. We got a score of 33fps in GFXbench, while other benchmarks that measure overall performance were a bit of a mixed bag with AnTuTu and PCMark favouring the Qualcomm chip while Quadrant went in the Exynos’ favour.